This type of a fire pit is great if you have the space necessary to install it. However, everyone doesn't have the amount of space needed for such a permanent fixture in their backyard. I would suggest a portable fire pit, if this isn't what you are looking for. The finished product here was really pretty but not what I was looking for. The one I had in mind was the one shown on page 04- 05 of the Outdoor living Dreamscapes product catalog using the "RumbleStone System". I just need to know how many of each kind of block for the first row and I assume build up from there. The catalog mentions a "kit" for the square one but I'm not finding any info on the round one using a round "fire pit" insert after the blocks are placed. The firepit done in the video was just as you saw it. Ken and I took a hose and decided what the homeowner liked and layed the block as it fit best. After the size was decided on we took the blocks out and put the chalk on over the hose. Next we layed out the base, leveled it, tampered, and built up from there. Using concrete adhesive is a must if you are not making a raised garden bed. We used 17 one foot blocks to make an 8 foot circle so if you decide you want to use the Rumblestone you will need at least 15 per level. I find it's best to have more blocks than I need to keep the project going until completion. I always keep a few around just in case one breaks for some unknown reason. The great thing about doing it yourself is the freedom of making it exactly how you want to. Tip: If you want a perfect circle you can use a stake and piece of non-stretch rope or wire to mark off your spot for the fire pit. Please follow this link to your original post. Please post some pictures of your fire pit project once you get it completed. 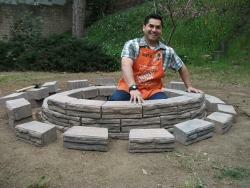 Or better yet show us pictures as you go so we all can see how easy it is to create a beautiful DIY fire pit.